Previous posts have shown how a single appliance's states can be determined from its power readings using a hidden Markov model. This post shows how a single hidden Markov model can be used to determine the states of multiple appliances from their aggregate power readings. 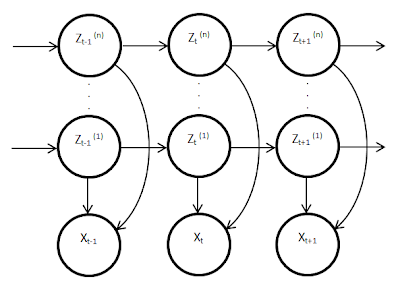 Once these model parameters have been calculated, the model is then ready to perform inference. The Viterbi algorithm can be used to infer the most probable chain of latent variables in a HMM given a chain of observations. This is different to sequentially classifying variables according to their maximum probability. This is because the sequential classification method is unable to classify a state which is individually sub-optimal, but leads to a sequence of states which are jointly more probable. Because such classifications are not revisited sequential classification does not guarantee to find the jointly optimal sequence of states. 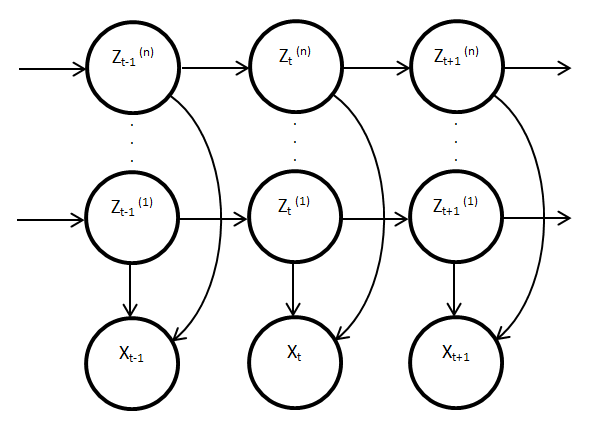 The complexity of the Viterbi algorithm is linear in the length of the Markov chain. However, its complexity is exponential in the number of appliances modelled. This is because the probability of each transition must be evaluated at each time slice. Since the variables correspond to each combination of all the appliance's states, the number of transitions is exponential in the number of appliances. This is acceptable for small numbers of appliances, but would become intractable for households containing many more than 20 appliances.